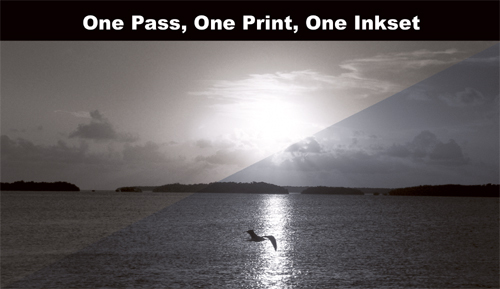 With the latest advances in digital photography many photographers that may have considered themselves darkroom only are finding themselves drawn to the possibilities and options that are offered by Digital Black and White Ink Jet Printing. Digital Black and White printing offers photographers, both new age and old school, unparalleled power in the digital darkroom. The latest MIS carbon-based inksets, when used with quality archival papers, allow inkjet printers to produce photos that look just like a silver print but with the archivability of pure carbon pigments. These inks offer photographers and printing establishments the ability to quickly produce prints in one or more tones with one printer and one inkset. A persons first impression of black and white printing inevitably turns to something much more complex once the overwhelming concepts of inkjet printing are understood. With input from many of our customers we have taken steps to reduce the complexity of this process. To help guide users to the correct inkset for their Black & White printing needs Inksupply.com has established a 3 tier system that breaks the printer/ink combinations down into groups based on required: user experience, software, printer, and extra hardware. This system will allow users to pick an ink that will work with their existing printer, or guide new users to a total solution that will fit their needs. For those of you interested in learning more about the evolution and development of Black and White ink jet printing from Inksupply.com please follow this link by clicking here. There is also more information available about the discontinued Quadtone inks by clicking here. The high level users of black and white printing are most likely aware of the various styles that have come about. A few years ago, black and white printing was left to the ability of the printer to change the output using the grey scale setting of the printer to print black and white prints, much like a simple text document. What we have found is a loyal group or inkjet artists that wanted to explore black and white printing using only black ink. Simultaneously to this groups development, there was a larger number of users that sought to print black and white prints using a gray scale ink set. This second group desired the ability for a larger tonal range. They sought Cool Tone, Neutral Tone, Warm and Sepia Tone prints, and everything in between. We place both of these groups in our professional Tier 3 and to fullfil their wishes, Inksupply.com supports a number of various inksets to achieve results for all types of output. You can read more about the evolution of these inksets, from Quadtone a term we coined many years ago, to the latest and greatest Ultratone inksets by clicking here or continue here to learn more about the 3 Tiers. Printing professionals and high level users will find a solution for all Epson Wide Format printers as well as all of the Epson Desktop printers including all 7 & 8 color printers. These products have been specifically designed to maximize throughput by taking advantage of icc profiling as well as the speed and resolution that these printers can provide. Tier 3 inks offer the most tonal options and include the ability to print split tone single pass printing with on screen proofing (when using icc profiles). Digital In Black And White, The Status Of Ink Jet Black and White Printing In 2005, by David B. Brooks, Shutterbug Magazine. Inksets designed for Tier 1 users were specifically formulated to work with the OEM Epson Printer Driver to produce gallery quality black and white inkjet prints with very little up front cost and no prior printing experience needed. Users can make prints from any image software package including; Photoshop, Paintshop Pro, PictureViewer, etc. With Tier 1 inks there is no need to use complicated workflows to produce high quality prints directly from digital color images. These inks are focused on printing just one tone from either warm or neutral depending on the version of the ink purchased. We have a number of customers that have won digital photo contests with some of these ink sets. Tier 2 inks were specifically designed to easily offer more tonal control to the user, but powerfull enough to produce gallery quality black and white prints. These inks can be used with the OEM Epson driver and/or pre packaged Photoshop curves to maximize print quality. Users can make prints from several software packages including; Photoshop and Paintshop Pro, however Photoshop Elements or greater is recommended for maximum performance. With Tier 2 inks users can produce variable or multiple (split) tone prints all from one printer with one ink. In some cases without jeapordizing the printers ability to print color. Tier 3 inks were designed with inkjet professionals in mind. These inks are designed to work with both desktop and wide format Epson printers to provide users with a proofing/production printing system. Tier 3 inks require the use of profiling hardware and software to maximize their potential. Users are encouraged to have a strong understanding of Adobe Photoshop 6 or greater, and experience with the use of custom profiles and the application of curves and their effects on final prints. Tier 3 inks are capable of producing variable and multiple (split) tone prints to give the end user "One pass, one ink, one print". The matrix below can be used to select the appropriate inkset for a given printer based on the tier that the user will be operating in. Some inksets may be available in more than one tier for a given printer due to inksets versatility. These inkset printer combinations will allow a user to move between two tiers by simply upgrading software, hardware, or increasing their experience level. The EB6 inkset was designed to be a 100% Carbon Matte only solution that offers the absolute best archivability. This inkset produces Carbon Tone (slightly warm) prints on Matte papers, with the choice of paper offering a small amount of tonal control. The EB6 inks can be used with PhotoShop Curves, ICC profiles or QTR. All of the above Ultratone inks use the same two black inks, Eboni black for matte prints and Photo Black for glossy or semigloss prints. These inks can also be used for Black Only (BO) printing using the Epson printer driver. The UTBO inkset has been specifically desiged for use with the Epson R800/R1800 printer. By installing the UTBO cartridges, both Black Only and Color prints can be made with the same printer. Read more about this approach on the Roark's Lab page.